Sever’s Disease, otherwise known as calcaneal apophysitis is an inflammation of the growth plate in the heel of growing children, typically adolescents. The condition presents as pain in the heel and is caused by repetitive stress to the heel and is thus particularly common in athletically active children. In 1912, J.W. Sever, MD, first described this condition in the New York Medical Journal. He described it as an inflammation of the calcaneal apophysis resulting in the clinical symptoms of pain at the posterior heel, mild swelling, and difficulty with walking. When a baby is born, most of the bones are still cartilage with only some starting to develop into bone. When the heel (calcaneus) starts to develop bone, there is generally one large area of development that starts in the center of the cartilage heel. This area of bone spreads to ‘fill up’ the cartilage. Another area of bone development (ossification) occurs at the back of the heel bone. These two areas of developing bone will have an area of cartilage between them – this is how the bone grows in size. At around age 16, when growth is nearly complete, these two bony areas fuse together. Sever’s disease or calcaneal apophysitis is usually considered to be due to damage or a disturbance in this area of growth. Overuse and stress on the heel bone through participation in sports is a major cause of calcaneal apophysitis. The heel’s growth plate is sensitive to repeated running and pounding on hard surfaces, resulting in muscle strain and inflamed tissue. For this reason, children and adolescents involved in soccer, track, or basketball are especially vulnerable. 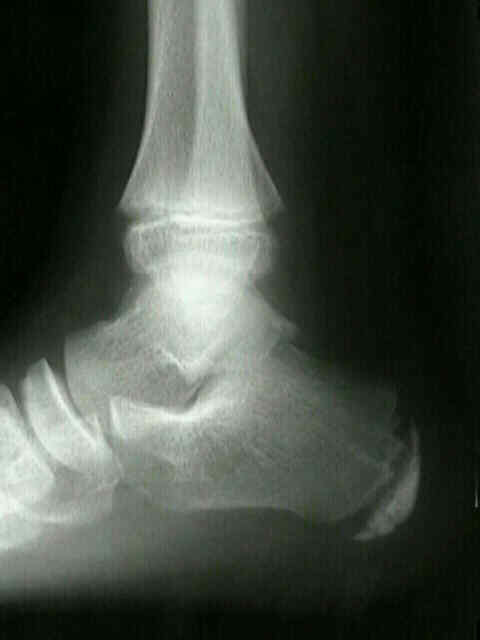 Other potential causes of calcaneal apophysitis include obesity, a tight Achilles tendon, and biomechanical problems such as flatfoot or a high-arched foot. Diagnosis of a calcaneal apophysitis is based on physical examination of the lower leg, ankle and foot, along with a review of the child’s medical history, recent activities, and symptoms. To rule out other more serious conditions, X-rays are often taken as well as other advanced imaging studies and laboratory tests such as MRI, CT Scan and blood tests. Use Supportive sneakers with orthotics for practice and save cleats for games. Often heel pain in children returns after it has been treated because the heel bone is still growing. 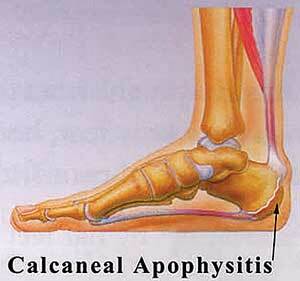 Recurrence of heel pain may be a sign of calcaneal apophysitis, or it may indicate a different problem. If your child has a repeat bout of heel pain, be sure to make an appointment.